A very hardy, dry tolerant shrub offering ornamental silver foliage which will tolerate regular clipping to produce a dense formal hedge. 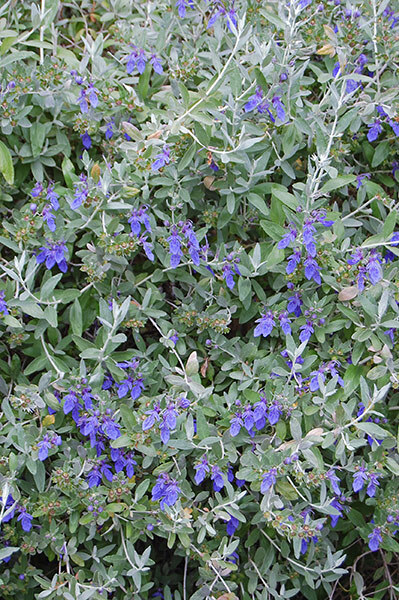 Left as a specimen shrub in the garden T. 'Silver 'n' Sapphires' will flower from autumn through to late spring with a display of blue flowers deeper in colour than those normally found in this species. 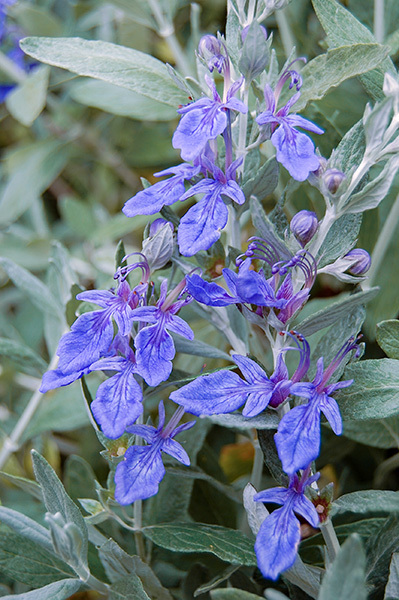 • Ornamental, silvery foliage year round. • Deep, true blue flowers from autumn through to late spring. • Responds well to clipping for hedging. Prefers a full sun location in most soil types given good drainage. Withstands dry conditions well once established but should be watered deeply occasionally during extended periods of heat. A hard prune after flowering will encourage a dense habit. If hedging, lighter but more frequent prunes to shape is required. An application of a slow release fertiliser after flowering is recommended.